NEW DEADLINE ANNOUNCED: THE TISCH FUND FOR CIVIC ENGAGEMENT WILL HAVE A *NEW* DEADLINE FOR THE SPRING 2019 SEMESTER: SUNDAY 4/14/2019. Funding will be considered for student groups and organizations, or individual students who plan to engage other students in their work. Priority will be given to projects that also engage communities beyond the Tufts campus. Individual applicants may apply for up to $500 in funding, and groups from the same school may apply for up to $1,000 in funding. Groups including students from different Tufts schools or professional degree programs are eligible for up to $1,500 in funding. Applicants must all be currently enrolled in Tufts university schools and professional programs. For cross-school initiatives, all parties involved must be stakeholders involved in the planning and execution of the project. The Tisch Fund will not cover individual conference attendance. Note for Fletcher students: The Tisch Fund will not cover Treks. Only applications whose project deadlines or events are a minimum of three weeks away will be accepted. Throughout the application process, Tisch College may provide suggestions for outreach, partners, and other event details to support the success of the event. The Tisch Fund application period for the 2018-2019 academic year is now open! *NEW* DEADLINE: April 14th, 2019. The deadlines for the spring semester were January 18th, 2019 and February 18th, 2019. If there is any additional funding available, an additional deadline will be created. The deadlines for this fall semester were October 3rd, 2018 and November 26th, 2018. Applications may be submitted for the next deadline after the previous passes, but they will not be reviewed until the deadline has passed. Be mindful of the three week minimum. For example, if you are applying for funding for an event on December 2nd, you should apply by the October 3rd deadline not the November 26th deadline. Seek to fund a diversity of programs across campuses and disciplines. Only consider projects that take place during the academic year. Projects that have a beginning or end date outside of the academic calendar are not eligible for funding. Not support events or projects that endorse a political candidate. Not cover stipends or gifts. Distribute funds via an internal Tufts transfer (for official Tufts student groups or those with costs associated with a Tufts department) or a check directly to a Tufts student. Students who are not members of official Tufts student groups will need to fill out a W-9 for to receive payment. Not directly purchase materials or pay persons or vendors for services to be provided as a part of a Tisch Fund project. Groups awarded funding will need to provide a complete budget and steps planned to pay outside vendors. Not used to fund speaker fees or honorariums. Political and social developments in the United States have inspired a renewed wave of student activism aimed at addressing issues of race and discrimination. The influx of polarizing speech and discourse has also spurred interest in improving dialogue across various differences and viewpoints. Recognizing the need for seed funding and advising to support initiatives related to these topics, Tisch College reserves a certain amount of funding specifically for students whose projects aim to address these issues. Students who are awarded funding also receive feedback, advising resources, and opportunities to present their work. The application and criteria for funding are the same as for the general Tisch Fund projects. Contact Brianda Hernandez, Student Programs Administrator, at Brianda.Hernandez@tufts.edu, or Maggie McMorrow, Program Administrator, at maggie.mcmorrow@tufts.edu. Medical students should contact Jennifer Greer-Morrissey, TUSM CSL Coordinator, at jennifer.greer_morrissey@tufts.edu. Dental students should contact Nancy Marks, TUSDM CSL Coordinator, at nancy.marks@tufts.edu. Read about projects supported by the Tisch Fund in 2017-2018. 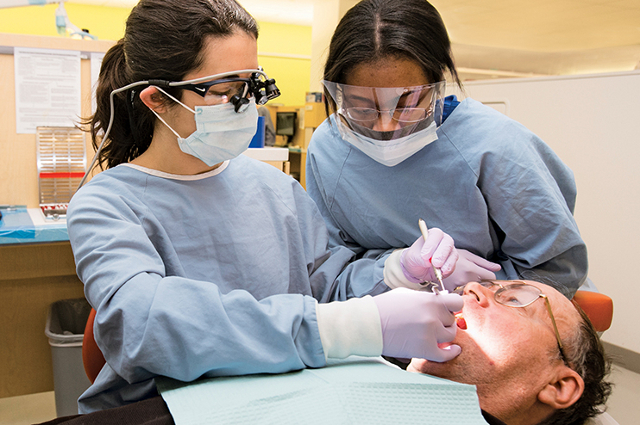 The Tisch Fund for Civic Engagement has supported dental students who become mentors to kids from Madison Park, a technical vocational high school in Boston.